Shruti from 13 Woodhouse Road is hosting a Blog Hop called Know thy Machine, where a few of us bloggers can share what machines we have, what we like, what we don't like. It is a great way to check out what can be had out there...especially if you are shopping for a new one or even upgrading! She asked us to answer the following questions...make sure you read through carefully...she has a question on her blog and if you answer correctly, you are entered into a giveaway!!!! 1. What machine(s) do you have? Brand and Model. 2. When and where did you buy it? What were the reasons for selecting this(these) particular model(s). What was its approximate cost. Babylock Emore: I bought this in machine in 2008. I wanted a machine to do my sons' school polo shirts. I didn't want a combo deal. I bought this machine when it was being phased out for $400.00 at my LQS. I made up for the money I spent on the machine on the amount I saved by buying plain polo shirts instead of the uniform store shirts. 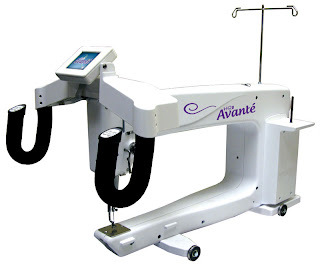 Handiquilter Avante Long Arm Machine: I love this girl. I bought her last year at the Houston Quilt Festival this time of year. She was a class machine, was used for classes at the show, so she was marked down from normal retail . I received a new frame that was shipped within a week or two after the show. By December, I had her all set up. You can also go to this post HERE to see how I came to make a decision after shopping last year! My advice? If you are truly in the market for one, go give them a spin at a show and seriously consider buying a demo or class machine! I use the brand names for the first two machines. I also have not made any covers for either smaller machines. It just isn't on the "urgent" list! As for my longarm? She is named Ole Betsy. She was named by my boys and Mr. Boss. Because she hangs out in the garage with creepy crawlies, I have her covered with some old drapes I have no use for. Free fabric that keeps dust off. Someday, I'd love to make her a rockin' cover! Emore: I have a love/hate relationship with her. I find her to be finicky and I dread when I mess up. However, I have found that is the case with many of my friends that embroider on any machine. The one thing I can say is that I am still very happy that I didn't buy a combo unit. I get a lot done on the other machines while she is stitching away! I will never regret that choice. Symphony: I love her. She never makes me unhappy. I only make mistakes when I miss her bobbin low warning. I love how smooth she is. I love so many of her features. I have no complaints. At all. She was approximately $1800 retail. Ole Betsy: I am VERY happy with her! I am still learning, but I seriously CANNOT complain. I had some buyer remorse when I thought I should have gotten the larger throat (24"), but while using mine, I realize that I have short arms, and I would be really stretching to get to the back of the 24" machine! It was meant to be...so definitely keep in mind how long your arms are!!!!! Emore: Anything and all. I try to make ANYTHING work...sometimes it gets the best of me and I have to learn to say "no, I can't embroider on that"
Symphony: Quilts, clothes, bags....you name it. I find that so many women are buying their machines online. I say definitely do so, but find somewhere to test drive them. I think you must give them all a drive run before you make your final decision. 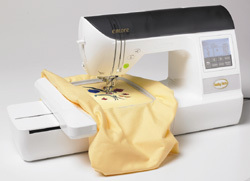 My first inclination was to buy a Babylock or a Gamill longarm machine, but was really disappointed with the Babylock and intimidated by the Gamill, and came home with the Handiquilter. You never know!! Ole Betsy. The purchase of Ole Betsy....I will never, ever forget it. I honestly intended to go to the quilt show and shop around so I could bring back all the information and my thoughts. I never dreamed that my husband would pile up all the boys in the car and come home with a machine. She qualifies for my next 20 birthday and Christmas presents...but, oh well!!! I have two things on my list. I would like to add the computer program to my long arm. Wow...it would be nice!! Also, someday, I would love to have the bigger Babylock that has many thread selections and can embroider on anything (hats). I am currently limited to tiny, 4x4, and 5x7. I also have a mulitpostional frame...but I avoid it at all costs. Too big! However, if I did that, I would have to get more serious about doing embroidery...and that is a whole 'nother story! And especially thank you to Shruti for having me!